Security cameras have perhaps never been installed in such a magnificent setting. 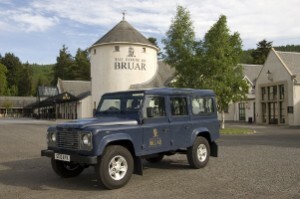 SANYO Full HD cameras have been deployed to deter and detect thieves who might be tempted to steal the valuable merchandise on offer at the House of Bruar, Scotland’s most prestigious country store, which sits like a castle at the foot of the spectacular Bruar Falls. Offering everything from Scotland’s largest selection of cashmere, to Barbour clothing and ladies’ tweed accessories, House of Bruar near Pitlochry in Perthshire, provides for all tastes and age groups, attracting over 1.3 million visitors every year and unfortunately a handful of would be shoplifters. The new CCTV system, which was installed by Scottish Communications Group coincided with the recently built extension of the House of Bruar. It comprises 16 VDC-HD3300P Day/Night vandal resistant domes which are used to monitor the high cost merchandise, entrances and aisles, and 4 VCC-HD5600P Day/Night PTZ cameras in external housings that monitor the car park and surrounding areas. All cameras are connected over an IP network with the images relayed to the House of Bruar’s control room. Since the installation was carried out at the end of 2010, House of Bruar has been able to use video evidence captured by the cameras to achieve successful convictions of shoplifters. Robert Day, Retail Manager for The House of Bruar, said: “Gone are the days of grainy images recorded on VHS tapes, these new SANYO Full HD cameras can provide an unmistakable image from as far away as 300 metres and we now have the ability to record and store the video evidence on a high quality recording system. Everyone, police included, has commented on the quality of the images and how they are the best they have seen. The system is quick and easy to use and is a great tool in the fight against shoplifters. With the new Full HD cameras, thieves have no way of denying it was them. Both the cameras, the VDC-HD3300P and the VCC-HD5600P have the capability to capture full high definition (1920 x 1080) sharp colour images at 25 frames per second and are equipped with a Dual Codec to support both the latest H.264 compression standard as well as MJPEG. Installed by local company, Scottish Communications Group, the disruption to the store was minimal with the cameras installed discreetly so as not to distract from the architecturally striking shopping outlet built and managed by owner Mark Birkbeck.